Google continues to experiment with Google Shopping displays beyond the traditional thumbnail box panel of Product Listing Ads. This latest version is larger than the sponsored result spotted earlier this month for the book “Don’t Make Me Think”. Found by Twitter user Britney Muller of Pryde Marketing, the sponsored result for “Nest thermostats” — now owned by Google — incorporates Google Shopping’s 3D product view. The result presents information from Google Shopping including a list of merchants with prices, product details and reviews all in one box in the search result. Clicking on the tiny “3D” icon brings up window with the full product view. Users can view each side of the product by moving it manually with their mouse or by clicking on the individual product shots. Expanding the number of products with 3D views in Google Shopping has been a priority for the gTech Partner Solutions team which is producing the images in partnership with manufacturers. This search results presentation is likely to garner many more impressions for the 3D product views than they receive from within Google Shopping itself. 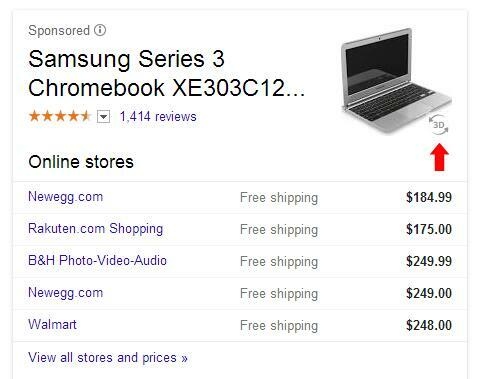 We haven’t been able to replicate this for other products yet, including other Google produced products such as Nexus and Chromebooks, but we can expect to see Google continue to experiment with incorporating more Google Shopping content into the search results. Update: I haven’t been able to replicate this, but Glenn Gabe of G-Squared Interactive spotted this version for the Samsung Series 3 Chromebook.